Brazilian Blowout- The Hottest Hair Treatment on the Outer Banks! Are you tired of frizzy hair? Is your hair damaged? Do you want your hair to be healthier? You need to come down to Hairoics for our Brazilian Blowout! Jeanne Griffin visited us recently, and you can see the difference a Brazilian Blowout made for her. The summer weather can make even the best hair frizzy, but Jeanne’s Brazilian Blowout made her hair as smooth as silk. 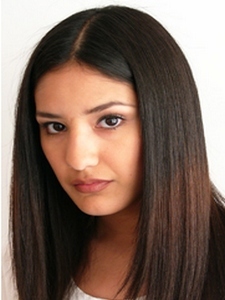 The Brazilian Blowout is a smoothing treatment which makes hair frizz-free, shiny, and manageable. No longer will you fear the humid days here on the Outer Banks. You also don’t have to worry about the effects of blow-drying your hair because each strand of your hair will be sealed against damage. A Brazilian Blowout is good for improving the health of your hair. It fortifies the individual strands with amino acids. This makes it an excellent treatment for healing processed hair. It can be done to permed hair, color treated hair, and hair with highlights. The treatment seals the hairs’ cuticles and will give your hair enhanced color and radiance. 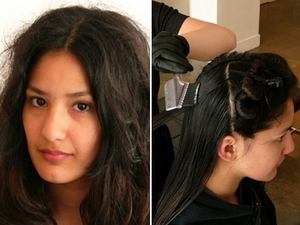 We also may be able to help you if you have Japanese straightened hair or extensions. You can swim with it, blow dry it, let it air dry, and touch up the color of your Brazilian Blowout hair. The wonderful thing about a Brazilian Blowout is that it helps to heal and protect your hair while making it beautiful and luxurious. The Brazilian Blowout is described by veterans of the treatment as “miraculous” and “life changing”. See for yourself and call the hottest hair salon on the Outer Banks today to set up your appointment for a Brazilian Blowout! https://i1.wp.com/outerbankshairsalon.com/wp-content/uploads/2010/07/brazilian-blowout-obx1.jpg?fit=700%2C454&ssl=1 454 700 Hairoics https://outerbankshairsalon.com/wp-content/uploads/2015/03/hairoics-obx-salon-logo.jpg Hairoics2010-07-25 21:47:532014-05-24 22:46:16Brazilian Blowout- The Hottest Hair Treatment on the Outer Banks! Spicing Things Up With Hair Color! Keeping Your Hair Healthy on the Outer Banks!